If you would like to see what your IBCP pathway will look like then choose from the options below. This is just for fun, however if you would like some feedback on your choices be sure to include your name and school email address at the bottom and Mr Cornes will reply with some feedback. Note: A BTEC Diploma is equivalent to 2x IB HL subjects and you will have 8 hours of this subject on your timetable per week. A BTEC Subsidiary Diploma is equivalent to 1x IB HL subject and you will have 4 hours of this subject on your timetable per week. Recommendation: For all students we recommend that you study at least 1x HL to enhance your higher education prospects. Recommendation: For creative BTEC subjects (Art, Media, IT and Performing Arts) it is OK to 'double up' and study the same subject in IB, for example BTEC Art with IB Visual Arts. However, this is not recommended for BTEC Business or BTEC Sport where universities would prefer that you studied alternatives such as IB Economics (over IB Business) and IB Biology (over IB Sport Science). South Island School are proud to announce the continuation of our newest programme: the International Baccalaureate Career-related Programme (IBCP). This additional new offer will be for the current Year 11 student cohort that will be commencing Year 12 study in the 2018-19 academic year. 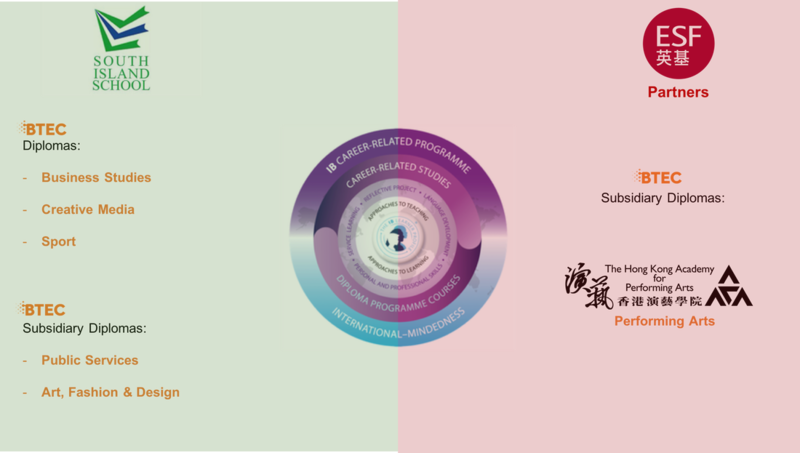 As the IB’s fourth programme, the IBCP provides a comprehensive qualification framework that links the academic rigour of the Diploma Programme with the career-related experiences of our BTEC courses and partnerships with HKAPA and SCAD to create a personalised, career-focused, post-16 pathway. For the career-related component of our offer, South Island School will provide a choice of 4 ‘major’ options (students choose one) including BTEC Diploma courses in Business, Sport, and Creative Media or a BTEC Subsidiary Diploma in Art, Fashion & Design. In addition to these BTEC courses students may also pursue their career-related studies with our external partners Hong Kong Academy of Performing Arts or Savannah College of Art & Design. These courses will make up approximately half of the IBCP programme. The IB courses a student may take (known as stand-alone ‘Certificates) can be selected from any IB Programme subject area, ideally to complement a student’s career-related area of study. Students must opt to take at least two IB Certificates together with an IBCP ‘core’ which includes personal and professional development, a reflective project, service learning, and language development. These elements are all delivered and assessed by SIS and then externally moderated by the IBO. Because of the ‘bespoke’ element of this qualification, students not wishing to take the full IBCP programme will still be able to elect to follow a combination of BTEC and IB Certificates – this reduced offer would not gain an IBCP but can still deliver very good University places in different parts of the world. Should you have any questions about the IBCP please don't hesitate to contact me by clicking on the icon to the left. 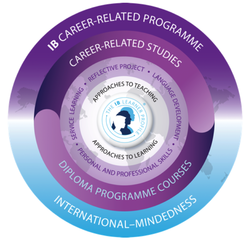 The Career-related Programme is the most recent addition to the IB. Its key aim is to provide a choice of different pathways for students aged 16 to 19. Modern life places complex demands on graduates entering further/higher education or employment. An integral part of the Career-related Programme is enabling students to become self-confident, skilled and career-ready learners. To prepare students to succeed in a rapidly changing world, schools must not only equip them with the necessary skills and the learning dispositions, but also the ability to manage and influence change. • become involved in learning that develops their capacity and will to make a positive difference. ​The Career-related Programme requires the study of at least two Diploma Programme courses alongside the unique Career-related Programme core and a career-related study. • The choice of at least two Diploma Programme courses provides and enhances the theoretical underpinning and academic rigour of the programme. • The Career-related Programme core aims to develop personal qualities and skills and professional habits required for lifelong learning. • The career-related study further supports the programme’s academic strength and provides practical, real-world approaches to learning. ​The distinct advantage of the Career-related Programme is that schools can adapt the framework to meet local, regional or national education requirements, as well as address industry and government priorities. Below is an example of a student timetable. At it's absolute minimum an IBCP student will have 18 (36 hours) lessons over a two week cycle if they choose to study their IB subjects at standard level. At it's maximum an IBCP student will have 20 (40 hours) lesson over a two week cycle if they choose to study their IB subjects at higher level. For further info on option choices please refer to the careers & further guidance page. The components of the core are at the heart of the Career-related Programme and are designed to enhance students’ personal qualities and professional development. Please view their individual pages to find out further information. The students chosen Diploma Programme courses are assessed in the same way as all other IBDP students at South Island School. Indeed, both IBDP and IBCP students will be in the same class, receiving the same experiences. More details on assessment can be found in the school handbook and in the relevant subject guides. The Career-related Programme core is assessed in several different ways. The personal and professional skills course is internally assessed by South Island School. The language development course is internally assessed, either by the school or by the external provider, and authenticated by the school. The reflective project is internally assessed by the school but externally moderated by the IB. The personal and professional skills, language development and CAS courses must be satisfactorily completed for the award of the Career-related Programme; satisfactory completion is determined by the school and reported to the IB through the IB Information Systems (IBIS). The career-related study (BTEC) is assessed internally and moderated by an external verifier annually. All work will be submitted and assessed through Managebac. a. The student has completed the specified career-related study. b. The student has been awarded a grade 3 or more in at least two of the Diploma Programme courses registered for the Career-related Programme. c. The student has been awarded a grade of at least D for the reflective project. d. Personal and professional skills, service learning and language development requirements have been met. The student has not received a penalty for academic misconduct. ​All students will receive programme results detailing their level of achievement in the Diploma Programme courses and the reflective project along with the status of completion of the Career-related Programme core. The IBCP is growing in recognition as a standalone qualification worldwide. In the UK students can use a combination of the IBCP and BTEC qualifications to form a strong portfolio for application to top universities. 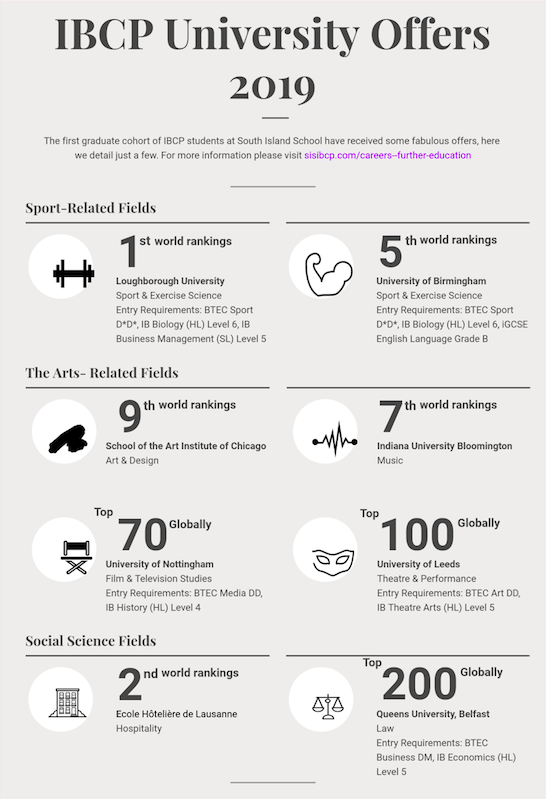 The IBCP is also an attractive package for applications to the US, Australia, Canada and higher education institutions across Europe and the rest of the world. Click on the link to the left or the Case Study link below for further information.